Shots are key to any unrememberable evening of drinking, but coordinating the two glasses necessary to shoot and chase can be exhausting, and incredibly confusing. Thankfully, sweet Mother of Cuervo, the Quaffer is here. 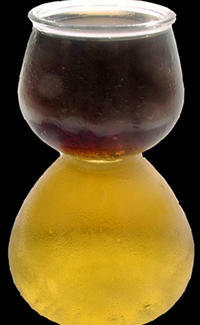 The Quaffer is an oversized shot glass shaped like a POM bottle. To load, just tilt, and fill the 2.25oz lower bulb with chaser and the 1oz upper bulb with shot. The Q's narrow waist prevents the liquids from mixing, so throwing it back unleashes a potent liquor/chaser one-two that'll have you fighting with oversized bouncers and undersized table lamps in no time. Some of the lethal Quaffer shots we recommend: Punta Del Fuego Bottom chase: Sunkist Orange Soda Top shot: Cheap Tequila The Autobahn Bottom chase: Cream Soda Top shot: Jager Redrum Bottom chase: Mountain Dew Code Red Top shot: Citrus Rum The Sophisticato Bottom chase: Ginger Ale Top shot: Fernet Branca There are also monster beer Quaffers available, holding 11oz in the bottom bulb -- perfect for your culturally insensitive car bombing of choice. But either Q will take the guess work out of binge-drinking and, more importantly, prevent you from suffering the indignity of training wheels ever again.